Dipteryx odorata (commonly known as "cumaru" or "kumaru") is a species of flowering tree in the pea family, Fabaceae. The tree is native to Central America and northern South America. Its seeds are known as tonka beans (sometimes tonkin beans or tonquin beans). They are black and wrinkled and have a smooth, brown interior. They have a strong fragrance similar to sweet woodruff (Galium odoratum) due to their high content of coumarin. The word "tonka" is taken from the Galibi (Carib) tongue spoken by natives of French Guiana; it also appears in Tupi, another language of the same region, as the name of the tree. The old genus name, Coumarouna, was formed from another Tupi name for tree, kumarú. The tonka seed contains coumarin, a chemical isolate from this plant, which also gave the name to it. The seeds normally contain about 1 to 3% of coumarin, but rarely it can achieve 10%. Coumarin is responsible for the seed's pleasant odor and is used in the perfume industry. Coumarin is bitter to the taste, however, and, in large infused doses, it may cause hemorrhages, liver damage, or paralysis of the heart. It is therefore controlled as a food additive by many governments. Like a number of other plants, the tonka bean plant probably produces coumarin as a defense chemical. Radio-carbon dating of D. odorata stumps left by a large logging operation near Manaus by Niro Higuchi, Jeffrey Chambers, and Joshua Schimel, showed that it was one of around 100 species which definitely live to over 1,000 years. Until their research, it had been assumed unlikely that any Amazonian tree could live to old age due to the conditions of the rain forest. 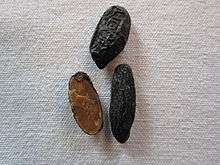 Tonka beans had been used as a vanilla substitute, as a perfume, and in tobacco before being banned in some countries. They are used in some French cuisine (particularly, in desserts and stews) and in perfumes. Its use in food industry is regulated/restricted in the United States by the Food and Drug Administration. Many anticoagulant prescription drugs, such as warfarin, are based on 4-hydroxycoumarin, a chemical derivative of coumarin initially isolated from this bean. Coumarin, however, does not have anticoagulant properties. The beans were formerly also spelled "tonquin" and "tonkin", although it has no connection with Tonkin, now part of Vietnam. Tonquin is still used today to flavor some pipe tobaccos, such as Samuel Gawith "1792 Flake." Cumaru, also known as Brazilian teak, is an increasingly popular hardwood used for flooring in the United States. It has a very appealing natural color variation and is considered quite durable as it has a 3540 rating on the Janka hardness scale. Cumaru decking has a Class A fire-resistance rating, because it has a Flame spread Index of 20. To qualify for a Class A rating, the wood must have a Flame Spread Index of 25 or less. Today, the main producers of tonka beans are Venezuela and Nigeria. The cumaru tree is an emergent plant, and a light-demanding calcifuge tree which grows on poor, well drained soils. The best growth is reached on fertile soils rich in humus. In the native region there is a mean annual temperature of 25 °C and about 2000 mm rainfall per year with a dry season from June to November. In general, it has a very low plant density, but depending on the agricultural use, the density and the age of the trees diversify. In seed production systems, the plant density is higher and the trees are older than in timber production systems. The tree flowers from March to May, and the fruits ripen from June to July. So, the fresh fruits are picked up in June and July, and fallen pods are harvested from January to March  or sometimes earlier. The hard outer shell is removed and the beans are spread out for 2–3 days to dry, after which they can be sold. The major producer is Venezuela, followed by Brazil and Colombia. The most important importing country is the United States, where it is used especially in the tobacco industry. This species is well known locally and generates an important income for rural families, particularly as a buffer in times of hardship. It is used for timber and nontimber products, so it is crucial that the use of this resource occurs in a sustainable way. The yield of beans per tree is about 1.0–3.5 kg per year, but cumaru trees produce a large volume of seeds every four years. This fact results in a gender dynamic. During years of low seed productivity, household income is controlled by the women. They invest in the family by buying food and basic resources such as clothing and school supplies. In years of heavy production, men control the income. During those seasons, they invest in the family by buying vehicles and tools, such as motorcycles and chainsaws. ↑ "2006 CFR Title 21, Volume 3". Retrieved 2009-07-06. ↑ "Cumaru decking and hardwood flooring compared". Retrieved 2015-10-27. ↑ Greg Banasky (April 18, 2013). "Test Report No: RJ2432-2" (PDF). QAI Laboratories, Inc. Retrieved 2015-10-27.